'Windows', 'Components' and 'Items' are the foundation on which a test-suite is built. They represent the windows and components of the SUT as well as the sub-items of complex components. Many of the other node types need a window or component as a target, e.g. events or checks. To that end their 'QF-Test component ID' attribute must be set to the 'QF-Test ID' of an existing 'Window', 'Component' or 'Item' node. All of the windows and components of a test-suite are collected under the 'Windows and components' node, which is always located at the bottom of the suite. This node is a surrogate for a window in the SUT. 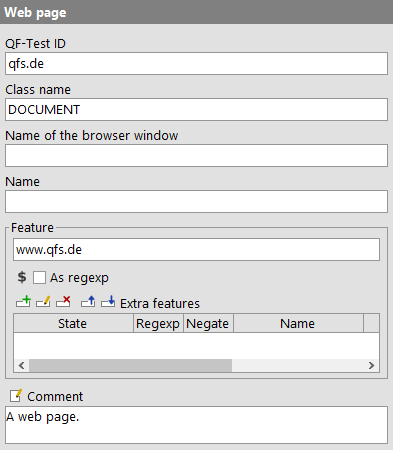 Events, checks and other nodes refer to it by its 'QF-Test ID'. Contained in: 'Window group', 'Windows and components'. This ID is the means by which other nodes refer to this window. Therefore it may appear in many places and you should take care to assign an ID with a meaning, i.e. one that is easy to remember and recognize. A QF-Test ID must be unique within the test-suite. Restrictions: Must not be empty, contain any of the characters '#', '$', '@', '&', or '%' or start with an underscore ('_'). The fully qualified name of the Java class of the window or one of its superclasses. Restrictions: Must not be empty. The name of the window that was set by the developers of the SUT with the setName(String) method. See section 44.2 for why and how names should be set on all "interesting" components. If there is no 'Name' available for the window, QF-Test tries to recognize it by a characteristic feature. In the case of a Frame or a Dialog this is the window's title. See section 44.2 for more information about component recognition. 4.0+ You can select »Escape text for regular expressions« from the context menu for escaping special characters of regular expressions of that text. If this attribute is set, the 'Feature' is a regular expression (see section 44.4). This extra feature is just for information. It has no influence on component recognition. Target components matching this extra feature have a higher probability for component recognition than those that don't match it. The target component must match this extra feature. Any component not matching it is no candidate for component recognition. Additional columns allow for matching against a regular expression or to negate the expression, e.g. to define that the "class" attribute of a DOM node in a web page should not be "dummy". The absence of an extra feature can be enforced by adding one with an empty value. It's also allowed to use variables for those columns. You can open a textual editor via double clicking the cell and specify the respective variable then. 4.0+ You can select »Escape text for regular expressions« from the context menu for escaping special characters of regular expressions of the value. QF-Test automatically assigns some extra features to recorded components. columns Web Column count in TABLE components. imagehash Swing, SWT Shows the hash value of icons of a button or menuitem. qfs:class All Dedicated component class, e.g. de.qfs.QfsTextField. qfs:genericclass All Generic class of the component, e.g. TextField. qfs:item Web Shows the item index of a DomNode, if it's an item of a complex GUI component. This could get recorded, if some child nodes are additionally recorded as those component might be interesting as well. This could affect content of lists, tables, tabfolders or trees. qfs:label All Shows a matching label for the component, e.g. the text of a button or a label close to the respective component. If no own text or label could be found, it also tries to use tooltips or icon descriptions. qfs:matchindex All Index of components with the same name. Possibly assigned automatically when the Validate component recognition during recording option is active. qfs:modal Web Shows if a component of the class "Window" is modal. qfs:originalid Web Shows the real 'ID' attribute specified in the DOM for that node. qfs:systemclass All The toolkit-specific system class, e.g. javax.swing.JTextField. qfs:type All The generic type of the component, e.g. TextField:PasswordField. In case of a Dialog this attribute determines whether the dialog is modal. The X/Y coordinate, width and height of the window form the basis for the recognition of the window. However, they play a minor roll as long as either a 'Name' was provided or a 'Feature' is available. For windows whose location and size vary widely you should clear these attributes. Note If no values are specified, the recognition algorithm starts with a perfect geometry match for all candidates. To prevent false positive hits you can disable geometry matching by setting the values to a single '-' character. Restrictions: Width and height must not be negative. The GUI engine to which the 'Window' and all its 'Component' children belong. QF-Test records awt for AWT/Swing and swt for SWT. Only really relevant for SUTs with more than one GUI engine as described in chapter 41. Web A 'Web page' is a variant of a 'Window' node specifically used for testing web applications. It represents the top-level document in a Browser. Nested documents in <FRAME> nodes are represented as 'Components'. In contrast to a 'Window' a 'Web page' has no 'Class name', 'Modal', geometry or 'GUI engine' attributes as these are either implicitly defined or redundant. This ID is the means by which other nodes refer to this page. Therefore it may appear in many places and you should take care to assign an ID with a meaning, i.e. one that is easy to remember and recognize. A QF-Test ID must be unique within the test-suite. This attribute can be ignored unless you need to test a web application with multiple open browser windows holding similar documents. In that case the 'Name of the browser window' attribute can be used to identify the browser window. The name of a browser window can be defined via the 'Name of the browser window' attribute of a 'Open browser window' node. You find a brief description how to handle multiple browser windows in FAQ 24. A web page has no name unless one is implemented via a NameResolver. See subsection 47.1.6 about the extension API for NameResolvers. The main 'Feature' of a web page is its URL with the parameters removed. If the option Limit URL feature of 'Web page' node to host or file is set, the URL is further reduced to the host or file name. 'Component' nodes represent the components of the SUT. Other nodes refer to them by their 'QF-Test ID', similar to the way 'Windows' are referenced. The 'Window' node that is the direct or indirect parent of the component must be the equivalent of the component's window parent in the SUT. Contained in: 'Component group', 'Window'. This ID is the means by which other nodes refer to this component. Therefore it may appear in many places and you should take care to assign an ID with a meaning, i.e. one that is easy to remember and recognize. A QF-Test ID must be unique within the test-suite. For SWT and Swing application this is the fully qualified name of the Java class of the component or one of its super-classes whereas for web applications there is a pseudo class hierarchy described in section 5.4. The actual class recorded by QF-Test depends on the setting of the option Record system class only and on potentially registered ClassNameResolvers (see subsection 47.1.7). Upon replay, class matching is based on the actual or pseudo class hierarchy, so you can manually change this attribute to any of the element's base classes. The name of the component that was set by the developers of the SUT with the setName(String) method. See section 44.2 for why and how names should be set on all "interesting" components. If there is no 'Name' available for the component, QF-Test tries to recognize it by a characteristic feature. These two fields hold additional structural information needed for component recognition during a test run. The 'Class count' is the number of components within the same parent container and with the same class (or a class derived thereof). 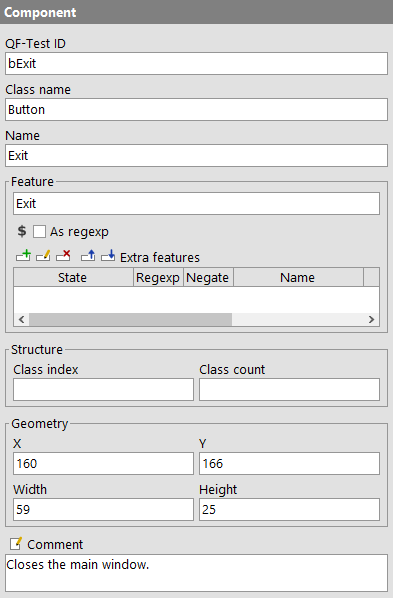 The 'Class index' is the index that this component has in the list of these components with matching class. As usual the first component has index 0. When counting the components of matching class, invisible components are considered as well. This is more robust but means that the values may be higher than expected. Note It is possible to specify just the 'Class index' or the 'Class count' attribute. The X/Y coordinate, width and height of the component form the basis for the recognition of the component. However, they play a minor roll as long as either a 'Name' was provided or a 'Feature' or structural information is available. For components whose location or size typically vary widely at runtime, these values are not recorded. For complex Swing components like JTable or JTree it is possible to define 'Mouse events', checks or queries relative to a sub-item of the component instead of the component itself. Such a sub-item is identified with the help of an index, the 'Primary index'. This index can be given in one of three ways: as a string, a number or a regexp (see section 44.4). A string or regexp designate a sub-item with a corresponding representation while a number refers to a sub-item by its index. Like in Java the first sub-item's index is 0. 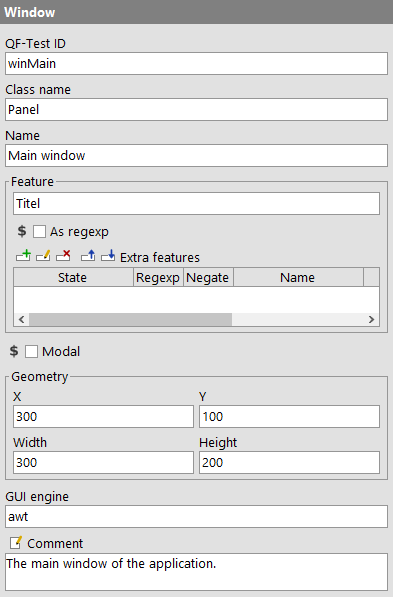 The JTable supports an additional index to refer directly to a table cell. The 'Primary index' determines the column and the 'Secondary index' the row of the cell. There are two representations for the nodes of a JTree component, flat like a list or as a hierarchy using paths. A node named tmp under a node named usr is represented as just tmp in the first case, as /usr/tmp in the latter. The option Represent tree node as path determines the representation used when recording sub-items. This ID is the means by which other nodes refer to this sub-item. Therefore it may appear in many places and you should take care to assign an ID with a meaning, i.e. one that is easy to remember and recognize. A QF-Test ID must be unique within the test-suite. Designates the sub-item. Depending on whether 'As string', 'As number' or 'As regexp' is selected, the sub-item is determined by its index or by a string or regexp match. It is OK to have an empty index, e.g. to designate a table column with an empty heading. Restrictions: Must be a valid number or regexp if required. For the JTable class two kinds of sub-items are supported. If only the 'Primary index' is given, a whole column is referenced. An additional 'Secondary index' designates a cell in this column. 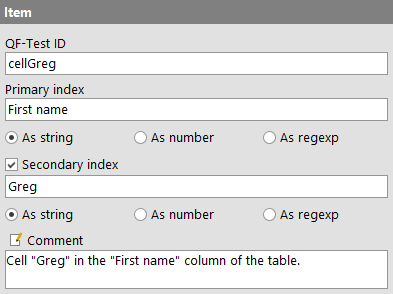 To define a secondary index its checkbox must be selected first. This is necessary to tell an empty index from a non-existent one. An empty secondary index designates a table cell with empty content. The 'Primary index' or 'Secondary index' is interpreted as a plain string. The sub-item is determined by matching its representation against that string. The 'Primary index' or 'Secondary index' is interpreted as a number. The sub-item is determined by its index. The 'Primary index' or 'Secondary index' is interpreted as a regexp (see section 44.4). The sub-item is determined by matching its representation against that regexp. A 'Window group's' only purpose is to provide structure to the 'Windows' of a test-suite. If you have to manage a large number of 'Windows' you can even nest 'Window groups'. Contained in: 'Windows and components', 'Window group'. You can choose an arbitrary name. It is displayed in the tree view of the suite. A 'Component group's' only purpose is to provide structure to the 'Components' of a 'Window'. If you have to manage a large number of 'Components' inside a 'Window' you can even nest 'Component groups'. Contained in: 'Window', 'Component group'. The 'Windows and components' node is always located at the end of the suite. It is the place where all of the 'Windows', 'Components' and 'Items' of the test-suite are collected.